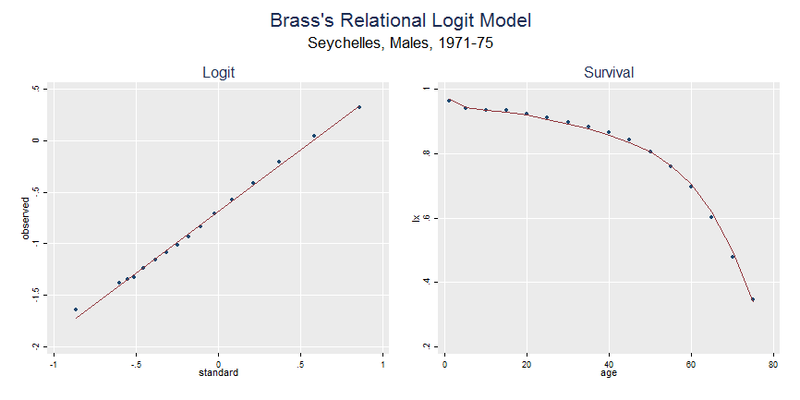 We illustrate fitting Brass's relational logit model using data from the Seychelles. 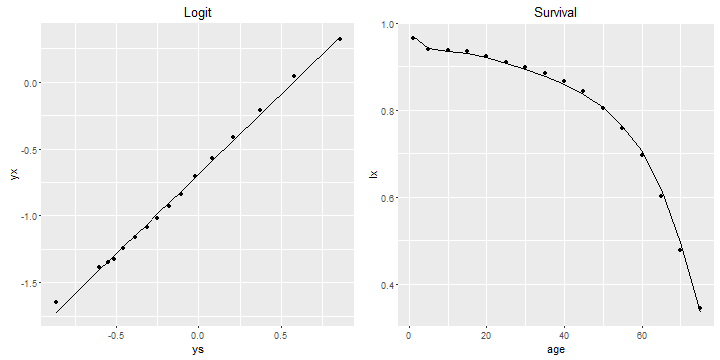 We generate Brass logits and plot the logits of the observed and standard survival functions to see if the relationship is linear. The relational logit model doesn't always fit well. Typically, lack of fit is noticed at the young and old ages. Zaba(1979) proposed a 4-parameter extension that incorporates two patterns of deviations from the standard and improves the R-squared to 0.9997. Ewbank, De Leon and Stoto (1983) proposed an alternative extension that uses different power transformations at young and old ages, converging to the logit as the powers approach 0. They also proposed a small revision of the standard below age 15. Both extensions are non-linear in the additional parameters and thus hard to fit, although the authors provide ingenious approximate estimation procedures. More recently Murray et al (2003) proposed a modified system that in addition to the logit transformation uses two additional sets of age specific coefficients which adjust for under-five and adult survivorship. For further discussion of model life tables, including the Princeton regional series of Coale, Demeny and Vaughan (1983) and the log-quadratic system of Wilmoth et al. (2012), see Tools for Demographic Estimation.